Depending on your specific needs, you may find yourself wanting to change how users are added to sites, as subscribers, within your WordPress network. For example, by default, users cannot add themselves to a random network site without making the request to the network admin or the site administrator of the site they want to be added to. This setup may work fine for most sites, but if you want your users to be able to register with existing sites within your network, then read on. For many people, signing up to the main site and then needing to be added to a child site can be confusing. Plugins, however, can make the process easier and less confusing for everyone. 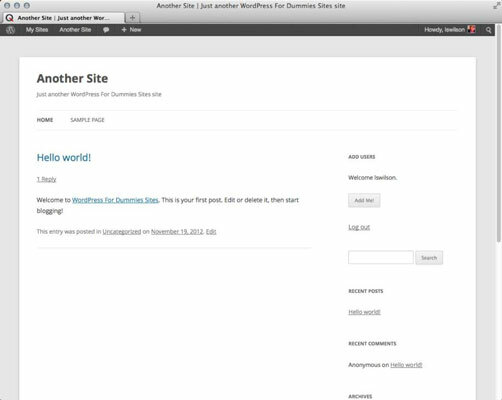 If you want existing users to be able to add themselves to existing sites on the network, the Add Users widget plugin, available in the WordPress Plugins Directory, allows them to do so. Install this as a regular plugin. When the network is activated, the plugin adds a widget on the Widgets page of every user’s Dashboard (hover your mouse over Appearance and then click the Widgets link) — the new widget is called the Add Users widget. The user must drag the widget to the appropriate sidebar to display it on the sidebar of the site where he wants users to add themselves. The site then displays a welcome message in the sidebar with a button labeled “Add Me!” that users can click to allow them to register for the site. If the user isn’t logged in to the network, the welcome message displays If you want to add yourself to this site, please log in., so remember, only users who are already network members and are logged in can add themselves to network sites by using the Add Users widget. When added to a network or a site, a user is assigned the role of Subscriber, by default. You may want to assign a different role to the user and automatically add him to your other sites in the network. When a user signs up for his own site, for example, you may want to assign him a non-administrator role. You may want to set his role to Editor to restrict the menus he has access to on the Dashboard and to prevent him from being able to use some of the functionality of WordPress. You may want to have new site owners sign up as editors for the sites, giving them fewer permissions on their Dashboard. The Multisite User Management plugin allows you to set a role other than administrator for new users who choose to have a site of their own. This plugin also allows you to set new user roles on other sites within your network (such as the default Subscriber role). Certain user roles have certain permissions that give users access to various menus on the Dashboard. However, you may want to close areas that you don’t want users to access. You can limit access to menus via the Menus plugin.